Buy through MusicWeb for £11.50 postage paid World Wide. Pietro Vinci was a Sicilian composer, born in Nicosia in central Sicily in 1515. Though his music was published in Venice, which was one of the big music publishing centres, his pieces were generally dedicated to illustrious Sicilians so we must presume that his training and background was Sicilian. He certainly seems to have travelled. From 1567 to 1581 he was maestro di cappella at Santa Maria Maggiore in Bergamo, and was probably in Naples in the 1550s as he appears to have had a group of pupils there, in addition to his Sicilian. His most important pupil was the Sicilian Antonio il Verso who based himself in Palermo after Vinci’s death. In 1591 the heirs of Girolamo Scotto in Venice published a set of part-books for a ‘Second Book of Motets and Ricercars in 3 voices by Pietro Vinci with Ricercars by Antonio Il Verso his disciple’. The collection consisted of eleven motets and fourteen ricercars for three voices; all the motets are by Vinci and there are seven motets each by Vinci and by Verso. The music was printed in three separate part-books and the ranges of the music would suggest that it would be suitable for a trio of viols. 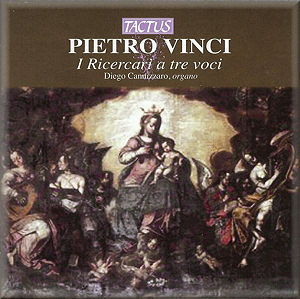 On this disc Diego Cannizzaro plays them on an historic organ. In the original publication Vinci’s Ricercars were alternated with Verso’s, the order being determined by the fact that Verso based his Ricercars on the models of his teacher. Vinci had already published a book of instrumental music for two voices in 1560 and Cannizzaro includes a selection of seven items from this at the end of his recital. These 2-part Ricercars all have curious names which generally refer to Sicilian people and places. His organ was built in 1666 by Giuseppe Speradeo in the church of San Pantaleone in Alcar Li Fusi, Messina. The organ was restored in 2000. Though the booklet includes an English translation of Diego Cannizzaro’s article on Vinci and Verso, the details of the organ are left in Italian, though there is a photograph showing that the instrument is indeed very handsome. From what I can gather the instrument has nine different stops and includes a pedal board. Quite whether a 17th century organ is the best medium for playing 16th century viol music is a moot point. Undoubtedly the instrument is an interesting one and in a state which renders a recital quite desirable. And one can understand Cannizzaro’s desire to play Sicilian music. But though the performances are creditable, there were moments when I missed the give and take of real chamber music. The music on the disc is charming and played with great variety by Cannizzaro, who draws on the organ’s admittedly limited resources to vary the registrations. This is rather necessary as the individual items all have a rather limited musical and emotional compass. The organ itself is a characterful delight, with a number of highly distinctive stops. This is more of a disc to dip into than to play in its entirety. It is a desirable disc on two counts, because of the rarity of music by Vinci and Verso in the catalogue and because it makes available a recording of such an historic organ. To enjoy the disc, though, you must compromise and accept the organ transcriptions of the instrumental pieces, on balance a small price to pay I think.